(Clearwisdom.net) In order to take part in the series of activities to celebrate the Melaka Tourism Street Carnivals 2008 in Malacca, Malaysia, the Divine Land Marching Band composed of Falun Dafa practitioners from Malaysia and the Singapore Divine Land Marching Band jointly performed at several places in Malacca on May 31 and June 1, 2008. The Singapore Waist Drum Group composed of Falun Dafa practitioners from Singapore added a joyous waist drum performance. The practitioners' unique performance was warmly received by citizens and tourists alike. The Divine Land Marching Band and the waist drum group arrived at the landmark tourist attraction - the A' Famosa in Malacca at dusk on May 31. The band's performance was powerful and vigorous, attracting the attention of many tourists. The band performed three pieces, including "Falun Dafa Is Good," "Fa Drums and Fa Trumpets Shake the World in Ten Directions," and "The Fa Rectifies Heaven and Earth." A tourist from Germany who a musician watched the performance by the Divine Land Marching Band. He commented, "This band's performance is a bit different (from other bands), but it is very good, very coordinated. I like it." Ms. Sha, a staff member from UiTM (a university) in Sealngor used to be a member of school band when she was in college. She said, "I've often heard performances from ordinary bands. But this is the first time that I saw bands from different countries perform together. Their performance was very good, with a lot of team spirit." 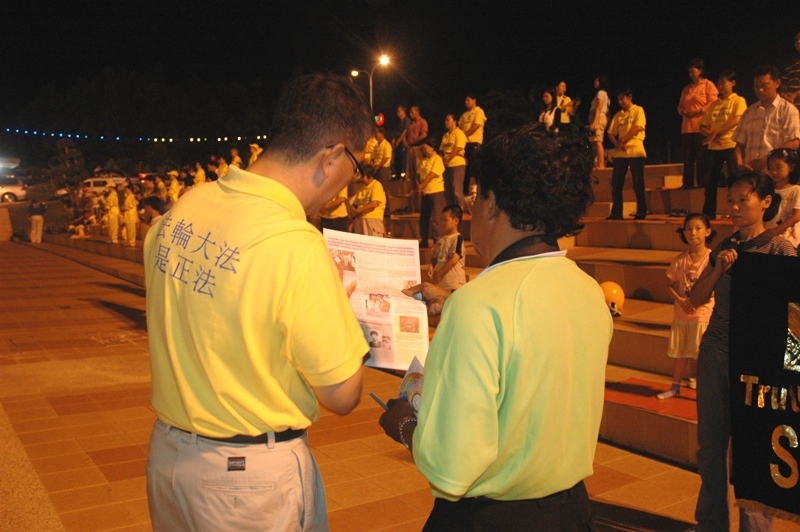 Government official Mohd Nordin Bin Yacob from Kelantan in eastern Malaysia traveled to Malacca for the first time. He told the reporter that he enjoyed the waist drum performance very much. "The music made us feel peaceful. My soul feels at ease," he said. 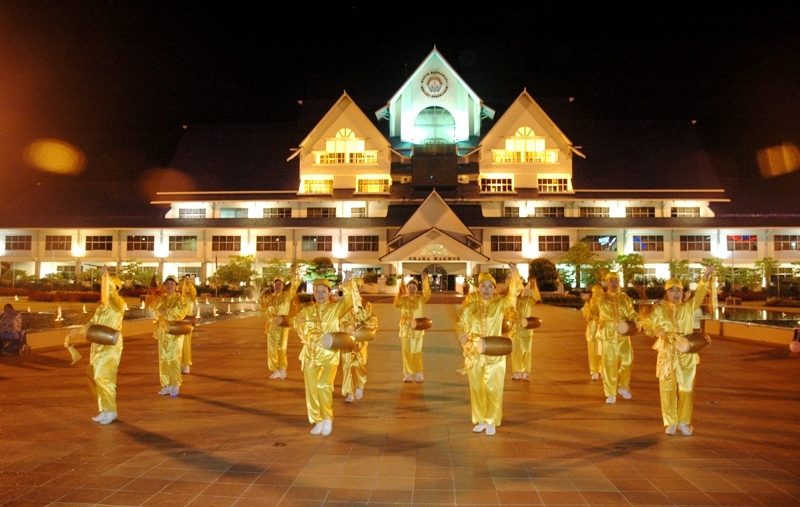 Later in the evening, the Divine Land Marching Band and waist drum group performed on the Malacca Town Square. The majestic performance attracted many people on the square and vehicles passing by slowed down to watch the performances. 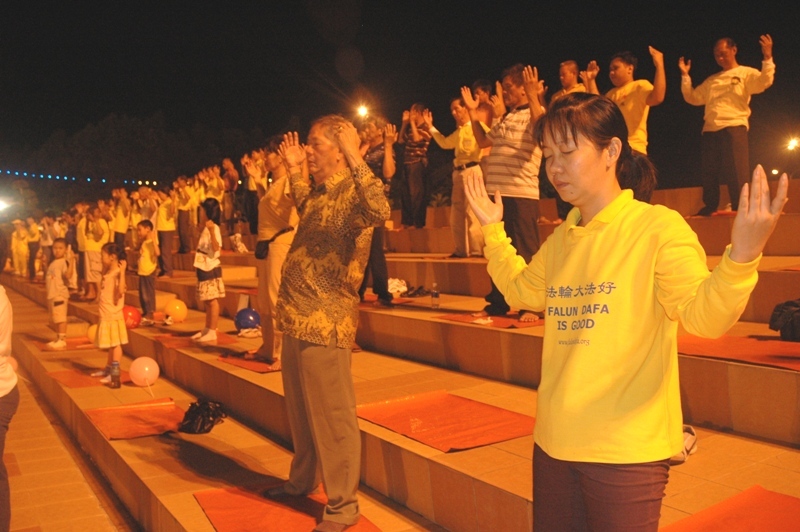 Some practitioners demonstrated the exercises, so the audience gained a better understanding of Falun Dafa. Local citizen Roslan said, "I found the performance to be very good. I think it is a beginning. It is really good that the State government arranged such a performance on the Malacca Town Square. The Divine Land Marching Band is really very good!" Another person, Akhmar said, "We are really lucky tonight. As there aren't any similar performances on other nights, it's a pity for those who did not come tonight." Shahabudeen from India is a company manager. He happened to bring his whole family to the Malacca Town Square for fun. He said excitedly, "The performance was really good. We really enjoyed it!" On the morning of June 1, the Malacca Dragon Boats Championship was held. The Divine Land Marching Band and waist drum group performed prior to the dragon boat race. 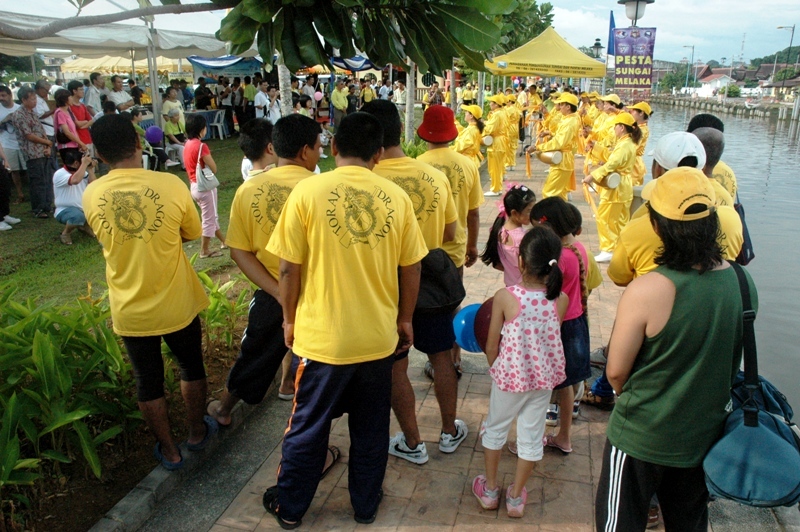 Shortly after Chief Minister of Malacca Muhd Ali Rustam came to the race site, the waist drum group was the only group that was arranged to perform for guests on the main stage. The Divine Land Marching Band returned to A' Famosa before leaving Malacca in the afternoon. They performed once more for the local people and tourists.